bl.uk > Online Gallery Home	> Online exhibitions	> Asia, Pacific and Africa Collections	> Buddhist temple, Kandy. showing a Buddhist temple at Kandy in Sri Lanka (Ceylon). Fiebig, of German origin, was active in Calcutta as an artist and lithographer in the 1840s. Little is known about his life, but turning to photography in the late 1840s he produced hundreds of photographs by the calotype process, frequently handcolouring them. 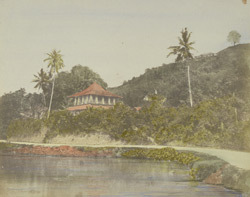 His photographs of Ceylon, probably taken in 1852, are considered the earliest surviving photographic record of the island. Kandy, in the central hil region on the Mahaweli river, was the capital from the 15th century till the advent of British rule in 1815. The national identity and culture of Sri Lanka has been shaped by Theravada Buddhism, practised by its Sinhalese majority. Sri Lanka has the longest continuous Buddhist history in the world. Buddhism was introduced here in the 3rd century BC by a mission sent by the great Indian emperor Asoka, led by his son Mahinda. It was in Sri Lanka that the Theravada canon, previously orally transmitted, was written down by monks in the 1st century BC, forming the sacred texts known as Tipitaka. The temple architecture of the country is emblematic of its Buddhist beliefs, its most typical structure is the dagaba or stupa usually raised to contain a relic and associated with the concept of Nirvana.